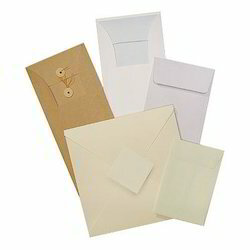 Our range of products include paper envelopes. Our enterprise is the remarkable name in the market deals in manufacturing, wholesaling and supplying an extensive range of Paper Envelopes. These envelopes are acts as a protective shield to the passbook and protect it from various obstacles like rainwater. Also, we provide these envelopes in various customized options as per client-specific requirements. Our envelopes are checked in terms of quality by our quality experts in order to deliver flawless range from our side.